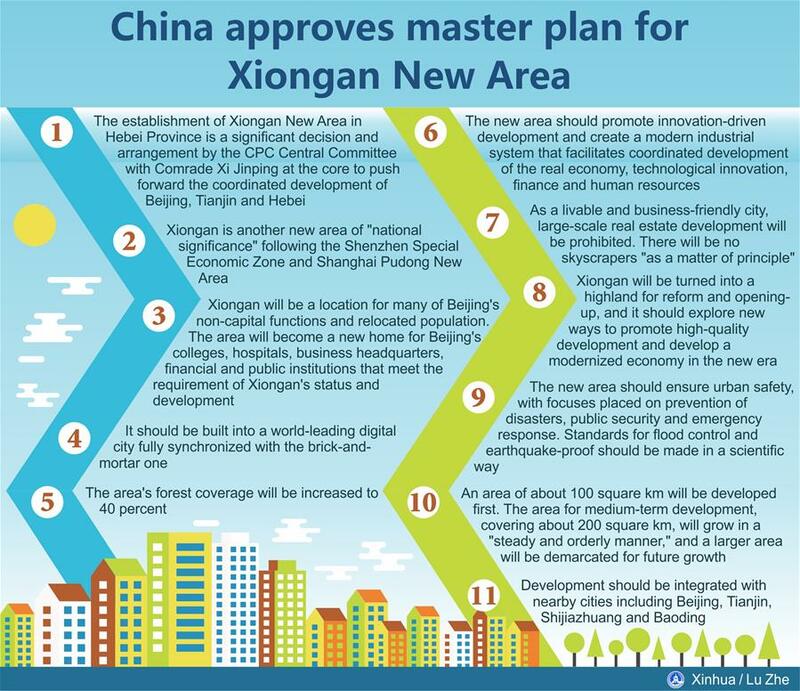 BEIJING, April 20 (Xinhua) -- China's central authorities have approved a master plan for Xiongan New Area, reiterating that its creation will carry "lasting importance for the millennium to come." The plan was approved by the Central Committee of the Communist Party of China (CPC) and the State Council, according to a document released on Friday. "The establishment of Xiongan New Area in Hebei Province is a significant decision and arrangement by the CPC Central Committee with Comrade Xi Jinping at the core to push forward the coordinated development of Beijing, Tianjin and Hebei," the plan reads. Xiongan is another new area of "national significance" following the Shenzhen Special Economic Zone and Shanghai Pudong New Area, according to the document. The area's creation is "a strategy that will have lasting importance for the millennium to come, and a significant national event." In April 2017, China announced the establishment of Xiongan New Area, spanning three counties in Hebei Province about 100 km southwest of downtown Beijing. (Xiongan) should have "a scientific, spatial urban layout," the document says. An area of about 100 square km between Rongcheng and Anxin counties will be developed first. The area for medium-term development, covering about 200 square km, will grow in a "steady and orderly manner," and a larger area will be demarcated for future growth. Xiongan will be a location for many of Beijing's non-capital functions and relocated population. The area will become a new home for Beijing's colleges, hospitals, business headquarters, financial and public institutions that meet the requirement of Xiongan's status and development. Xiongan will be under intelligent management. It should be built into a world-leading digital city fully synchronized with the brick-and-mortar one. Intelligent infrastructure will be incorporated in the basic fiber of the city. With maintaining a green environment one of the priorities, the area's forest coverage will be increased to 40 percent, according to the document. It says the new area should promote innovation-driven development and create a modern industrial system that facilitates coordinated development of the real economy, technological innovation, finance and human resources. As a livable and business-friendly city, large-scale real estate development will be prohibited. There will be no skyscrapers "as a matter of principle." Xiongan will be turned into a highland for reform and opening-up, and it should explore new ways to promote high-quality development and develop a modernized economy in the new era. The new area should ensure urban safety, with focuses placed on prevention of disasters, public security and emergency response. Standards for flood control and earthquake-proof should be made in a scientific way, according to the document. Development should be integrated with nearby cities including Beijing, Tianjin, Shijiazhuang and Baoding.